SEOUL, South Korea -- South Korean President Moon Jae-in painted a rosy picture of the ongoing denuclearization process on his nation's peninsula and said a second summit between leaders from the U.S. and North Korea could happen "soon." After that summit, Kim Jong Un may visit Seoul, added Moon, who, during his annual New Year's press conference at the presidential office, or Bluehouse, also urged China to continue to play a "positive role." Kim's recent visit to Beijing to meet with Xi Jinping stands out as a "good sign," the South Korean president said. Moon also noted that Pyongyang has offered concessions during the process of denuclearization and that he expects Washington to carry out similar corresponding measures "in order to gradually build trust." "This time, North Korea suggested a much more detailed process of denuclearization," said Moon, adding that North Korea would halt missile firings, dismantle nuclear and test sites, and scrap its Yongbyon research center. Moon spent most of the 20-minute speech talking about South Korea' economy, but the topic dominating the following question-and-answer session with 200 journalists was North Korea. Washington and Pyongyang, Moon said, have now narrowed differences over the past seven months since the Trump-Kim summit in Singapore, and it's time to take "bold steps." 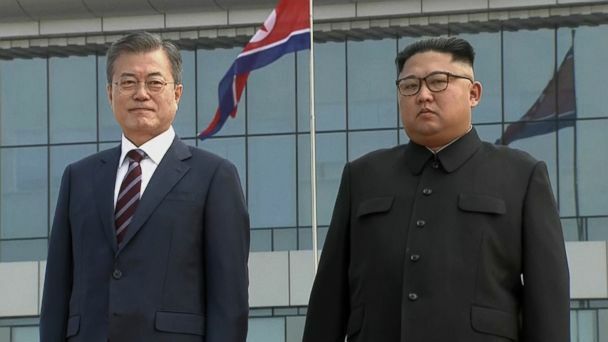 "The reason why the deal with North Korea is being delayed is because the two sides have spent a long period of time distrusting each other," Moon added. Regarding his relationship with Kim Jong Un, Moon said the letter he received from him at the end of last year was "very special, and, first and foremost, very sincere," expressing regret and explaining why Kim could not deliver the promise of a reciprocal visit in December. "By exchanging these letters, I expect more frequent meetings with Kim regarding inter-Korean relations and denuclearization issues," Moon said. "I hope to achieve accelerated progress in the future." Kim returned to Pyongyang Thursday from his four-day-long trip to China. North Korea is making an effort to achieve similar results from Kim's second potential summit with U.S. President Donald Trump, reported Xinhua, China's state news agency, quoting Kim. ABC News' Hakyung Kate Lee, Soohyun Kim and Liz Sunwoo Kim contributed to this report.